This is the second post about our unique trip to Playa Las Tortugas last June. To see how we got there and where we stayed, read Part One here. There were so many things to do without ever leaving the property. Of course, the beach was the number one draw, but after a morning playing in the ocean, it was nice to jump in the pool to wash off the salt water. A few days into the trip, we discovered that the pool had special visitors at night. As it got dark, fruit bats arrived by the dozens to eat bugs off the surface of the water. It was thrilling to watch the huge bats swoop down and skim mosquitoes and gnats. The pool lights remained on so we could see them clearly, and they flew so close we could feel their wings flapping. My dad and T were brave and actually got into the pool while they swooped around. One morning, my husband took the boys fishing. They hiked to a nearby village and met Juan who took them out on his small boat. Juan spent most days working in the local fields, and was thrilled to have paying customers to fish with. His boat was not equipped with fishing rods and reels, however. Instead, he used line tied to empty two liter pop bottles. When the boys felt a tug, they started winding the line up. My hubby was dubious that they would catch any fish, but they came home with quite a few! The boys fried them up, much to the dismay of Bella, who did not think men belonged in the kitchen. There was a Sea Turtle Conservation Camp on the property next door, and we stopped in to see the eggs the volunteers had gathered on their nightly patrols. One evening Pasqual stopped by to tell us that twelve babies had hatched and asked if we would like to help release them back into the ocean. They didn't have to ask us twice! Watching the baby turtles make their way back home was a highlight of the trip. A very large estuary ran behind the property, and we rented kayaks and explored for hours. Pasqual warned us that there were quite a few caymans if we ventured too far up the river. We saw dozens of birds, but no caymans, to the relief of my niece. Unfortunately I have no pictures from this adventure because I was too busy rowing and worrying about caymans! Our house sat in the middle of a coconut palm plantation, and we had been told to watch out for falling coconuts. 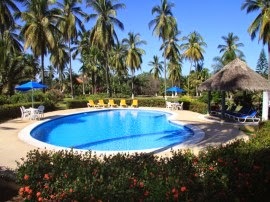 Luckily no one was hit by a coconut, but one morning a grounds keeper cut some open for us to drink. 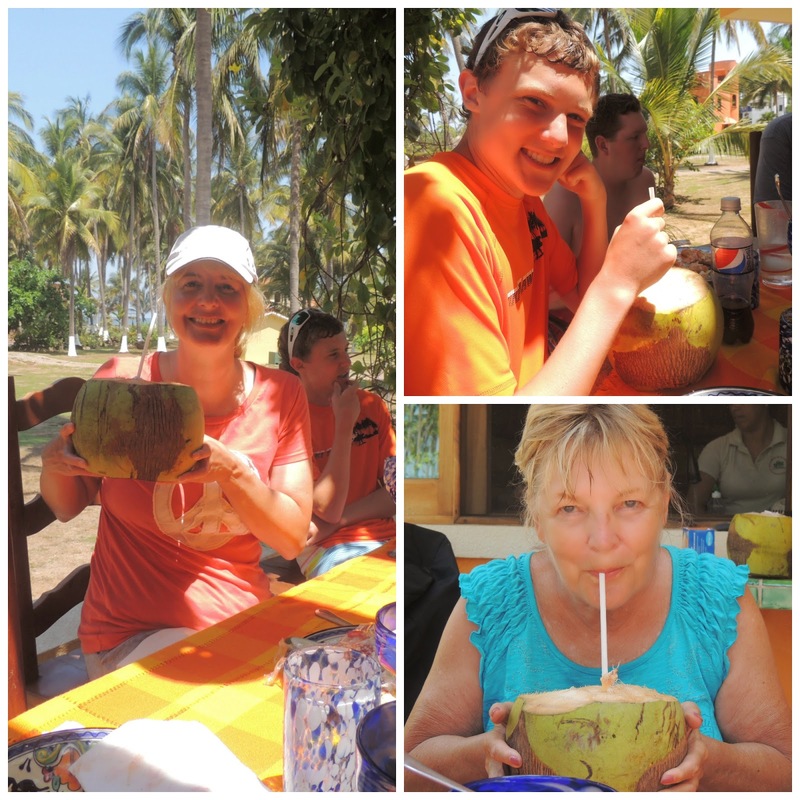 Fresh coconut milk is delicious and very refreshing! 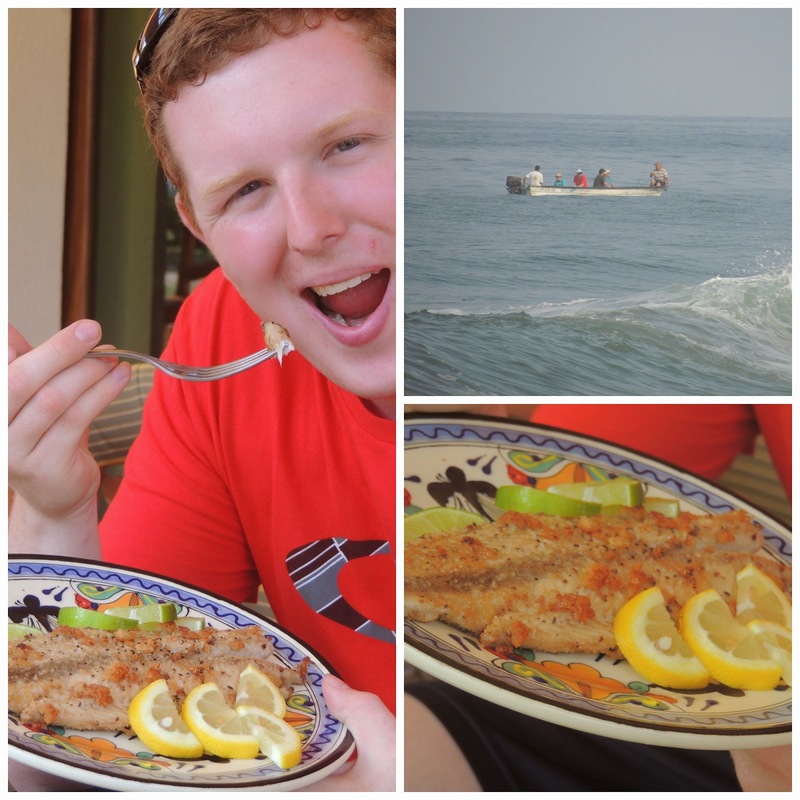 In part three of our Mexican adventure, we finally venture out to explore some neighboring villages. Stay tuned for all the excitement :)! You are so lucky to have participated in helping those adorable turtles get back to the ocean. I can see why it was the highlight of your trip. I grew up going to Florida every winter and my aunt's gardeners used to open fresh coconuts for us to drink. Delish. The turtles were so cute, and they wanted to get back to the ocean so badly! Thank you! I can't believe it's been almost a year since we went. It was so relaxing. 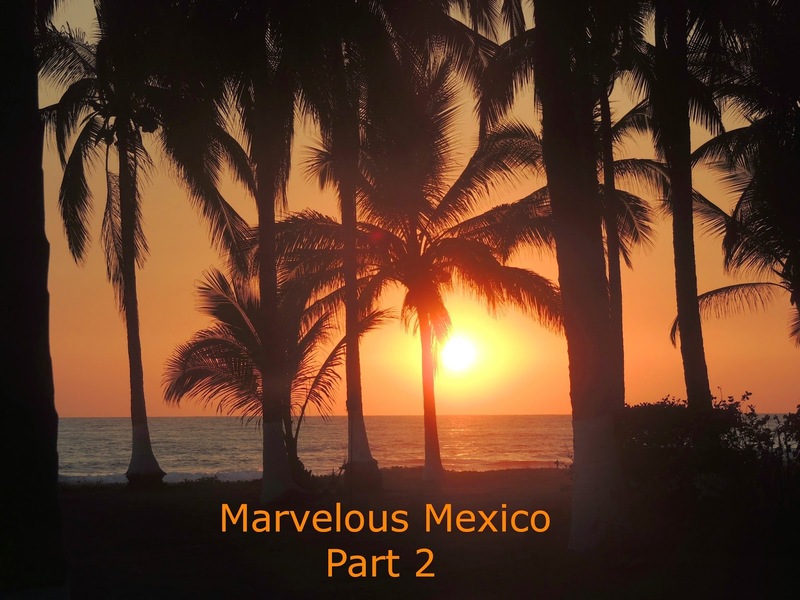 I have been hoping you would soon post Marvelous Mexico Part II ... and looking forward to getting a chance to visit your blog all day! Your boys are quite the cooks - the fish looks beautiful and delicious. I am so envious as I have always wanted to see baby turtles migrate back to the sea! What an amazingly wonderful vacation! Thanks so much for sharing it. It will be fun to hear about the surrounding areas in Part III! Thanks Susan. My hubby is a very good cook - much better than me! He sent Bella into a panic when he asked for flour - but she found some at another house. Can't believe it's been almost a year since this vacation - I want to go back! The bats were a little intimidating - but they did eat the mosquitoes, which was a definite plus! How wonderful! The fish looks delish. My kids would love seeing the baby turtles. This is too fabulous! We saw turtles hatching on a beach in Mexico, too Priceless experience! It was one of the highlights of the trip. I would love to do it again someday.